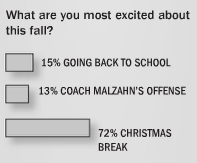 In a recent poll from the latest edition of The Plainsman, Auburn students were asked what they were most excited about: A) The first day of school, B) Gus Malzahn’s new offense, or C) Christmas break. Not so surprising, Christmas Break won in a landslide. But the first day of school beat Gus Malzahn’s offense? These kids need to do some soul searching.